Citing both the enormous amount of information currently available on crime and increased interest in the topic since September 11, editor Levinson aims to give readers a comprehensive overview by bringing together material from numerous sources. 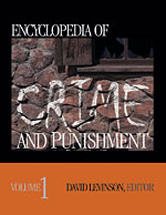 The encyclopedia covers a whole range of unusual topics. Written in a popular style, the work is not overburdened with graphs, statistics, or extraneous facts, which makes it a browser's paradise.